See the portuguese version of this document. Let's explain how all that happened. Gláucius Djalma Pereira Júnior, a official from Solution Informática (TC User), member of debian-rs and participant of temary grade of IFFS, ask me if Rildo or I was interested in give a presentation about the TC project in the IV edition of IFFS. From this invitation I call to Rildo and he answers me that he can't go to the forum due your commitments(Your clients not free him to stay three days in the forum). For we don't lose the chance of expose TC in a forum of this importancy, Rildo authorizes me to represent the TC project in that occasion. As the temary grade didn't aprove my authorization as the lecturer, I talk with Rildo and I argue that wouldn't suitable a user present a project while the project leader is a brazilian. Rildo agrees with me and accept be the lecturer, confirming that after his talk with his clients. All travel bills and guest house was sponsored by the event. For me, that never make a airplane travel, I think a great experience and I mature too much with it. This city, by your structure, planning and health qualify, can be considerated a one of best citys in Brazil. The most of people that lives in there was european descendent and this region is very known in the fashion(the brazilian models) and food (the barbecue) circuit. Making a comparation with the the most of brazilian citys and Porto Alegre, this city have lowest temperatures and detach yourself in the Free Software's use. Isn't coincidence that the most of sponsors of this events was public instituctions. Governors, ministers and members of Civil House(Federal Government) appear in this event. As is listened, this is the best important event about free software in Brazil. 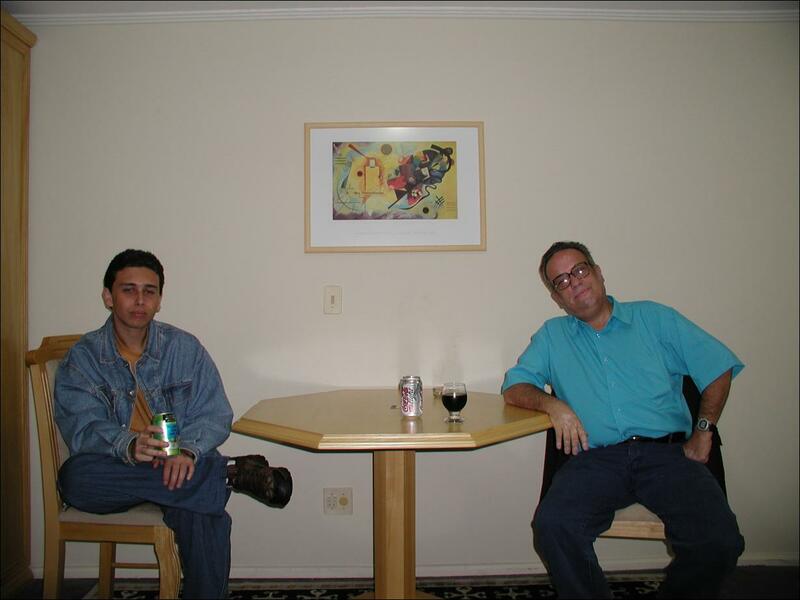 Rildo and I in his residence in the Hotel sponsored by IFFS. Was 3:00hs a.m and I'm very sleepy... This picture was photographed by Till's camera. Click in this picture to enlarge it. The first thing that I notice in Rildo is that he could be a CocaCola market boy. About soft drinks, he just drink the diet version of CocaCola(TM). Although he have fifty-two years old, he has a youth mind, he always talk your honest opinion and this event I can confirm the consideration that I have for him. I consider him a great friend. 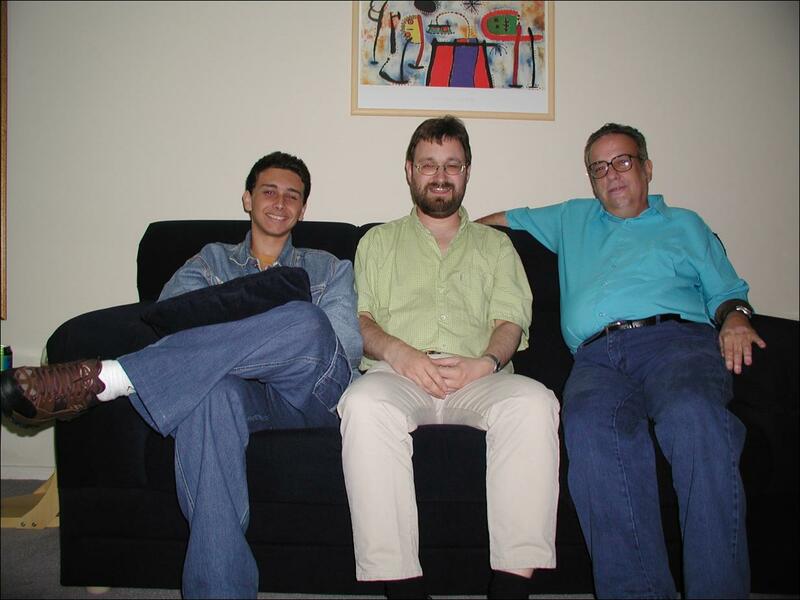 Rildo, Till and I in Rildo apartment sponsored by the IFFS. The previous photo was maked before that. The photographer was the same, Till Kampeter. Click in the picture to enlarge it. A another friendship that I made in IFFS was Till Kampeter, german, a official from MandrakeSoft, creator and only contributor of LinuxPrinting.org I never know a people that speak and know so much about printers. His and Rildo was born great friends too. I stayed known by them that Till donate to Rildo a Canon printer(Winprinter) to Rildo make a reverse engineering and to create a device driver for linux. Also, he discussed about the VebKlaso, a presentation software of lectures by web very promising(I participate from some testes), developed by Rildo. If I'm not wrong, Till was helping Rildo to get a presentation about VebKIaso in LinuxTag, the equivalent of IFFS in Germany. 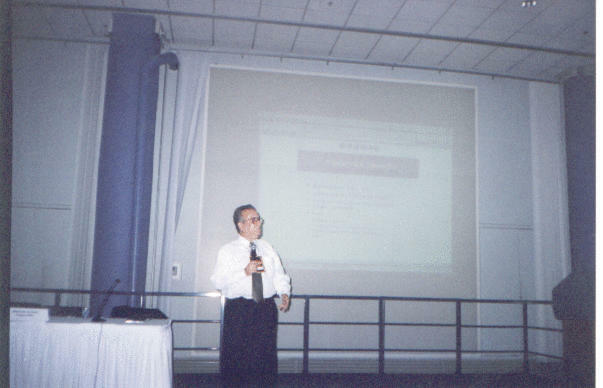 Rildo presenting the project. This photo was photographed by my camera. Click in the picture to enlarge it. The IFFS was in days 05, 06 and 07 of june. Our presentation was marked for the day 06 of June. We have 60 minuts to expose our ideas and talk about the situation and the future of TC. We combine of Rildo use 30 min, I use 15 min and give for the participants of the presentation 15 min to make your questions. A close-up more of nearby. This picture was photographed by my camera. Click in the picture to enlarge it. In presentation, Rildo said about the history of the project, main contributors, ports and documntation. Give details about the characteristics of the compiler(GNU assembly output, compilation, linkstep, run and debug), tools and the future of the project. We talk a bit about the COBOL-Utils project and how it could it work for all free projects about the COBOL language. I admire the Rildo's sincerity to talk across aproximadely 200 people that was at 2 years without contribute in project. My presentation have a little expresion, compared with Rildo's presentation. In my presentation, I talk exclusively about the TC project in Brazil. The questions asked in presentation was pratically the same: Portuguese documentation, the compiler status, support and tools. The most of interested people use the Micro Focus compiler in your UNIX systems and it have interest in a free COBOL compiler. 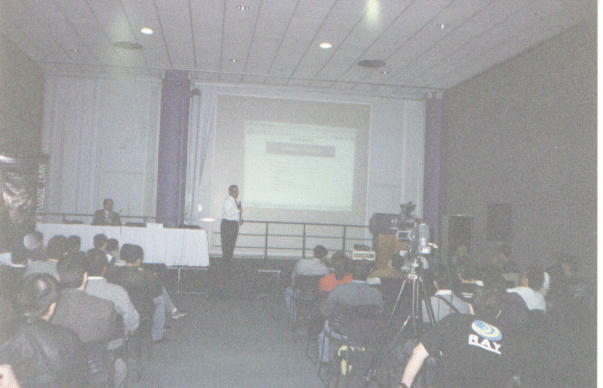 After the presentation, I know personally some contributors, that knows virtually across from TC brazilian mailing list, like Gláucius from Solution Informática, Moisés from Ramenzoni and José Luiz Pinto Twadorvski. People of some universities was interested in TC too. The funny is that I'm already expected all this repercution due to I have worked by 4 years in a Micro Focus partner and know how the business market for the COBOL language is huge. In my point of view, that was the points more importants about the travel to Porto Alegre. My notebook never was used so good. Before and after the presentation, Rildo and I pass all days discussing about the project. We discuss everything, about the problems in compiler implementation until the development of tools. The first subject that we discuss was the compiler bugs. In so far as I was talking about the TC particularities, Rildo explain me the behavior of the parser and scanner in TC. A one of the most discussed itens was the error messages, that could be improved and translated for other languages. I told to him that the most of brazilian TC users not make critics about the restant itens of COBOL 85 standard, but about the bugs that TC does. Like a example, I give like a example the InfoCont. I told for him about the several discussions that I have with Fernando Wuthstrack, the owner of InfoCont. I told for Rildo about the Fernando's hope of a possible port of your systems(develop under the MF) for TC because your systems follow of nearby the COBOL 85 standard. Finishing this discussions, I did suggested that wasn't implemented nothing more in TC but the all itens implemented was stabilized. Or which was the possible to stable, was stabilized. About Graphic Interfaces, we discuss a lot too. As I have installed in my notebook the demo versions of NetExpress 3.1, PowerCOBOL 3.0 and another add-ons like installers and Report Viewers/Generators, I show to Rildo a bit of how our tools should be developed. This subject was unfinished because it have a lot of possibilities and it's not possible to discuss all this possibilities in the days that we stay in Porto Alegre. We discuss a lot about the COBOL-Utils project and Rildo show yourself very favorable to it, suggesting that I try to assume this project as anyone was developing anything. He suggest that I learn C, TCL and all languages that was necessary to develop the COBOL tools. And this is the thing that I'm the most things that I'm have to make currently. About the contributions for the project, Rildo tell me that, in two years ago, he lost some clients and with this he stay impossible to contribute, like this clients was very important clients and its maintain your bills and your time. He does to show very interest in contribute with the compiler and with the COBOL-Utils project but in the present moment he cannot have a free time and when he have a free time, will back to contribute. In our discussions, he tells me a lot of times that he would like of see the compiler ready and usable. Tell me too that he wasn't happy of stop your works of the way that he stop. About the idea of get money to contribute with TC, he told me that he accept some proposals since that this proposals could have some compatibility with the reality who he live. Finishing this article, I can to say that the travel to Porto Alegre was very good because I know very well about the project, I get a great friend that was Rildo and talking with him, I get to adquire more hope that in a day, TC will be finished. In our discussions, I promise for him(and for myself) that until the end of year, I would develop documentation and samples for our project while that he promised came back to develop when he have a free time. As in Porto Alegre have all year a edition of IFFS, I will make which was in my possibilities for that we can deserve this invitation again.